Tonight on NBC their new show RUNNING WITH BEAR GRYLLS airs with an all new episode. On tonight’s episode called, “Tom Arnold” Tom Arnold and Bear explore the coastal mountains of Oregon, where they encounter river crossings and ocean-side cliffs. On the last episode World-renowned survivalist Bear Grylls (“Get Out Alive with Bear Grylls,” “Man vs. Wild”) spent two days with actor Channing Tatum (“22 Jump Street”) traveling through the tough terrain of Yosemite National Park in California. As they encountered challenging obstacles, Channing approached his adventure with the attitude that if Bear can do it, then he could too…or he’ll die trying. Did you watch the last episode? If you missed it we have a full and detailed recap, right here for you. 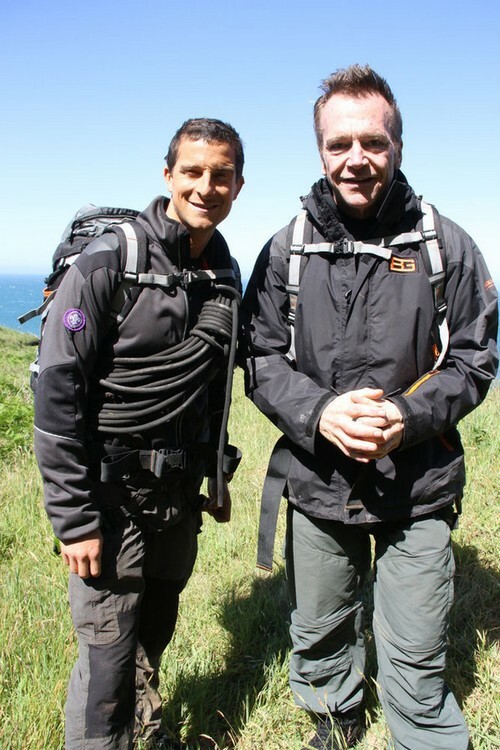 On tonight’s episode World-renowned survivalist Bear Grylls (“Get Out Alive with Bear Grylls,” “Man vs. Wild”) takes Tom Arnold (“Sons of Anarchy”) through the unpredictable coastal mountains of Oregon, taking on steep terrain, river crossings and oceanside cliffs. Arnold attempts to channel the courage and determination from his weight-loss struggle in order to tackle a journey that takes him to the brink of mental and physical exhaustion. RECAP: Tonight Bear is taking Tom Arnold with him to the wild, he used to be addicted to drugs and he’s doing the show to teach his son things about the wild; Bear wants us to get to know the real Tom Arnold. Tom doesn’t feel like he’s physically fit enough for this; Tom gets onto the helicopter with Bear and he’s holding on to the side of it. Bear Tom and Bear land out into the forrest; they are both going to travel the woodland. Tom is really nervous and not sure what to expect, he asks if there is a path to follow; Bear tells him they make their own. Bear asks if Tom did this a lot as a kid, Tom says he grew up going hiking a lot until he got his own car; the two now get to a giant cliff. Bear is sending the rope down, he’s not sure if he’s got enough to hit the bottom; they throw a rock down to judge the height and figure it might not be enough. Tom and Bear are know rappeling down together. They are taking their time down the cliff and Bear admits it is super hard; since they have no idea of the distance. Tom struggles a bit and falls over, he can’t see the bottom at all and hasn’t tested himself like this ever; the two get to the bottom and Tom is amazed he even did that. Bear shows off a kill mark on the forest, it’s a bears claw on a tree; they follow the marks to find a stream where bears like to hunt. Bear finds some bear poo and crushes it in his hand; Tom finds it so gross. Tom mentions he’s been married four times now and he’s super happy right now with his current wife, he is very happy to have had a child; the moment the baby was born he realized it was never about him anymore. Bear is going to slide down a hill of mud, his kids love doing it just as much as he does. Bear is at the bottom and Tom decides to go down next; he slides right to the bottom and Bear grabs him. Bear goes to collect some water; he notices there is a trout in the water and it’s a great find. Bear reaches in the water nd is trying to grab it, Bear pressed the trout against a rock; Bear takes the trout out and Tom catches it and gives it a kiss. Bear goes ahead and cuts out the eyes, he gives one to Arnold who was actually very happy totake it. Bear and Tom are going to cross over a river; they can only get over by a very small log. He notices how someone used a wire to hold on to get across; it’s not stable and could make them fall.Tom is incredibly nervous about this, Bear crosses it fast and finds out the log is solid. Tom os taking his time to go across, he’s clumsy and is just not so confident. Tom struggled at one point, he almost fell; though he starts taking his time and slowly going across it. Tom reaches the other side and can’t believe he ever did that; he’s incrediblypumped and is shaking. Tom and Bear continue, they haven’t found a decent camp site yet though; hoping they can find one very soon. Bear and Tom are going to use a tarp to make their own little shelter; Tom is so happy to get to rest now. The two are now making a fire, Bear lets Tom make the fire; the two are cooking their small trout. Bear takes the first bite and says it’s pretty terrible, Tom goes ahead and take s a bite and says it’s very thin; he actually likes it. Bear asks Tom about his tough times, Tom says he was a bad addict and alcoholic like his mother; when he started drinking it kept getting worse and using cocaine didn’t help either. He was depressed but couldn’t stop, it was hard to ask for help; after rehab he’s totally changed. Tom says that having a family is crazy and bigger than anything he’s done, he says he’s so happy to see his son every morning and he keeps him on a good path. The two now got to bed, though Tom turns on the camera and mentions he’s looking for wild bears, tom finds some chocolate and eats it. Tom’s muscles are pretty sore and now Bear is giving him some tea to wake up with; Tom takes a sip and believes it’s very good. Tom isn’t sure if he’s ready for today, but he trusts Bear. Bear and Tom are making their way to a river, they strip down in what they need so they can cross the river. They both stick together and shuffle through the river, it’s much faster than people give it credit for; the lean into the flow and cross it slowly. Tom mentions the water is so cold, , he is very proud he got through this; he believes that this kind of thing is the best anti-depressing activity.The two are now close to the extraction sight; Bear has a surprise for Tom on the beach. Tom and Bear are going to rappel down the cliff into the water; there are tons of sharp rocks at the bottom and it could kill them if they fall. Tom is afraid of heights, he is very nervous about this. Tom is going down first and he’s so scared being on his own, it’s very windy and Tom accidentally loses his grip a bit and slams into the wall; he gets back up and is now making his way down. Tom reaches the bottom and is so happy, Bear rushes down the side of the cliff fast and Tom is so glad to have come and learned some tips from Bear. He never knew he could do this stuff and realized this was more for him; the two get on an ATV and make their way back home.